Skydiving in Arizona? Some people may not think about desert parachuting, but our state is actually a very popular choice for skydivers for many reasons. First, there are some things you should know before choosing a diving center. Arizona parachuting is more than just a rush for many people; it's a way of life. Jumping out of an airplane is obviously quite a bit different than from, let's say, a houseboat into the lake. Even though that might be scary enough for some people... including yours truly! I have often thought about it but that is as far as I can get to actually considering skydiving in Arizona, or anywhere else for that matter. I DO, however, have great respect for those who do it though... it must be an experience like no other! You really need to do your homework to make sure that you choose the right diving center to ensure that you not only get your moneys worth, but more importantly, are going to be safe more than anything. Before purchasing a skydiving in Arizona package, or even making a deposit for your next skydive, confirm the physical address of the skydiving facility. Once you have the address, verify its identity to avoid being scammed. If they do have a refund policy, get it in writing. Life happens. You may change your mind about diving. Your significant other (or maybe your mother!) may successfully talk you out of what could be the most fun and exhilarating experience. What happens if you have an emergency and will not be able to jump on the day planned? Will you be able to get your money back without any hassle? These are all very good questions you should ask the parachuting facility. Ask the center just how long they have been in business and make sure their instructors are qualified. The United States Parachute Association, (USPA) provided me with some excellent information on just how to go about looking for a reputable company to fulfill your dream. The organization cautions consumers to beware of online marketers who are only interested in taking your money for what you thought was a great deal on parachuting. Apparently there have been some online scam artists claiming to have what they call skydiving networks where they will offer you, a reduced price. As a result, USPA has received many complaints about these individuals and warn you, the consumer to be very cautious when looking for a parachuting center. If you call a phone number, what you believe is an authentic skydiving school, and they cannot tell you their location without first asking your location, this should be your cue to look elsewhere. USPA advises that if they are an authentic facility, they will NOT immediately ask you what your location is. What this means is that you are dealing with a referral dealing directly with the school but merely a service. Whenever possible, ask if you can see their USPA membership card. Again, USPA stands for the United States Parachute Association. If they are a legitimate company, they will gladly show you their certification which allows them to be a skydiving instructor here in the United States. This is a fun and VERY exciting adventure. Make the most of it by going to a reputable skydiving center. Ask if there are any other fees that will be required of you to pay that you may not initially be aware of. Ask the skydiving facility what the final cost will be. Prices do vary so if you like to save money like me and everyone else that I know, call a few different skydiving centers and compare prices with other companies. Some parachuting drop zones use tandem jumps to introduce students into the solo training programs. The training needed for Tandem Freefall usually takes less than 30 minutes. There is also classroom training that is required prior to any jump if you plan on skydiving in Arizona. If you are fearful of skydiving in Arizona but still desire the thrill of parachuting, you might even feel better knowing that both the student and the instructor are attached to the same parachute system.. Both you and the instructor actually freefall together for an estimated 30 to 50 seconds, depending on jump altitude, ranging from 10 to 13,000 feet. Both you and your skydive instructor descend together under a single large parachute, but with dual controls. The cost of a Tandem Freefall, for the first jump training, typically costs around 100 dollars less than AFF and about the same as IAD and static-line training. Many schools offer video of the freefall and landing. The Accelerated Freefall jump includes instruction for the jump which includes instructions on climbing out and exit the plane. It also includes instructions on freefalling, the aircraft, canopy flight, landing, as well as the very important emergency procedures, if needed. During this type of jump, you, the student, still has the assistance of the instructors, but at this stage, you start to spread your wings a little. Here, you will exit the aircraft with two USPA AFF Instructors. You freefall together with your instructors for approximately 30 to 50 seconds, depending on jump altitude, typically 10,000 to 13,000 feet. The instructors keep a tight grip on your harness to provide in-air instruction. Once you descend to around 4,000 feet, you then pilot the parachute to the landing area. According the Parachute Association, Accelerated Freefalling, AFF, first-jump training and the jump itself requires more support from the staff than the other methods and is priced accordingly. AFF training and the first jump can often be accomplished the same day. Many schools offer in-air video of the freefall and landing. Both the Instructor Assisted Deployment and Static Line programs include practical instruction on climbing out of the aircraft and exiting as well. You will also receive instructions on freefall, canopy flight, landing, and the necessary emergency procedures while skydiving in Arizona. During this type of jump, you will be assisted during the climb-out by the USPA IAD or Static-Line Instructor You, the student will then exit the aircraft solo with the parachute deploying immediately. This is done at about 3,500 feet. 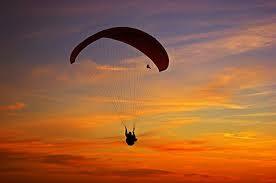 You then pilot your parachute to the designated landing area. This type of jump, along with the Static Line first-jump training, generally will cost 100 dollars less than AFF and about the same as a Tandem jump. IAD and static-line training and the first jump can many times be completed on the same day. Some facilities/schools will offer you a personal video of the exit and/or landing to prove you actually jumped out of the plane! Just picture the look on your friends faces when you share your skydive AZ experience!! Whether you wish to skydive in Arizona or view additional information on the the United States Parachute Association, you can visit their site at United States Parachute Association. If you live in Arizona, here is a local AZ skydive directory that will help you plan your adventure if you are serious about skydiving in Arizona. parachuting directory site for Arizona. AZ skydiving is quite popular here, especially in the cooler months. If you are considering other states as well, check out the national directory for other parachuting sites which is the national directory for parachuting sites.